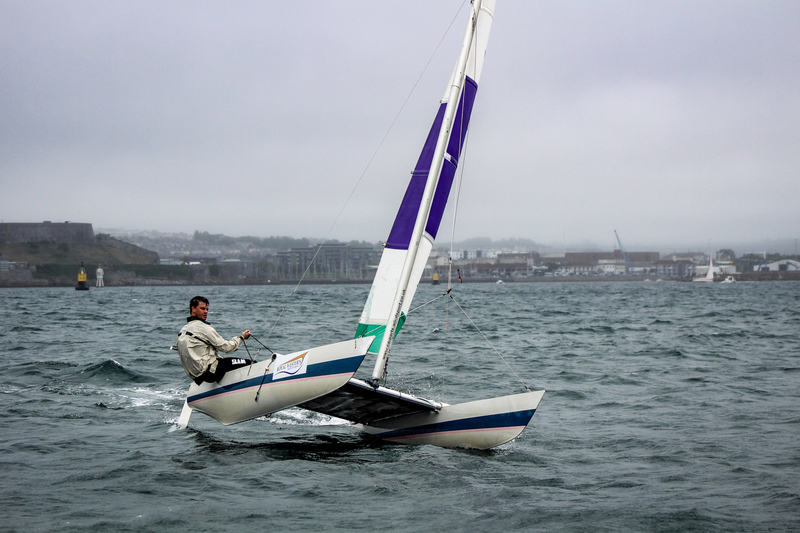 This was the first time a Sprint 15 TT was hosted by the Royal Western Yacht Club in Plymouth. There were 12 competitors including 8 visitors and 4 young local helms. We had a very warm welcome from the Royal Western team and we were all excited about the prospect of some good winds for our event. And it didn’t disappoint. Roger, our race officer, gave us our briefing and guidance on the best way out of the marina – a skill in itself. Roger set us a trapezoidal course out in the Sound where the wind was around a SW Force 3-4, with quite a choppy sea. Race 1 saw everyone off to a clean start with Jon Pearse leading us round the first mark, followed by Liam Thom, Ed Tuite Dalton and George Love. Jon’s lead was short lived as Liam overtook on the off wind leg and held the lead for the rest of the first lap. On the second lap Jon managed to take back the lead on the upwind leg, but again Liam’s off wind pace allowed him to power past on the reach and win the race, with Jon 2nd and Ed 3rd. 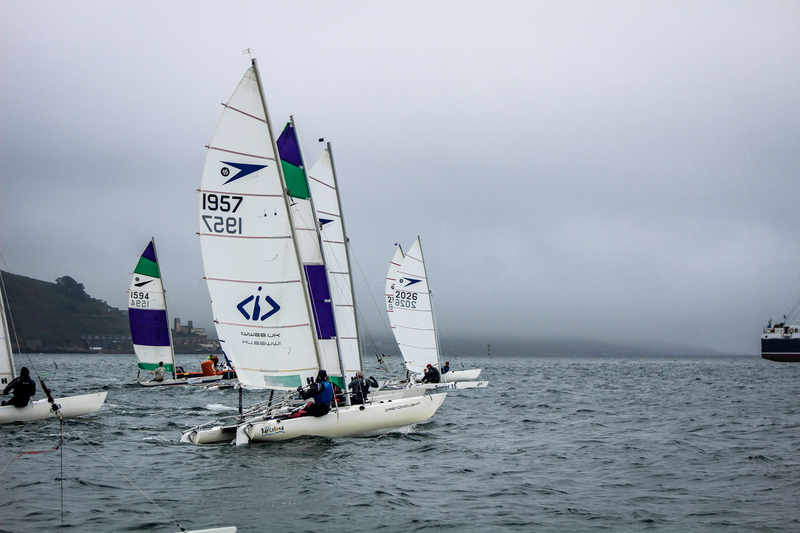 The middle of the fleet was closely contested by Yvonne Pike, Derek James and Aaron Kirby. In Race 2 Ed was first to the windward mark and held the lead until the downwind leg, when again Liam demonstrated his off wind pace and took and held the lead. George Love was closing fast on the leading 2 boats and on the second lap managed to overtake downwind to claim 2nd with Ed 3rd. Race 3 saw Liam take the lead again, consolidating his overall lead, but there was quite a contest for the next 3 positions between Jon, Ed and Jamie Ward from Royal Western, with Ed managing to overtake both the others on the final leg to take 2nd, Jon 3rd and Jamie 4th. We subsequently learnt that it was Jamie’s first time out in a Sprint 15, so he will be one to watch out for in future! 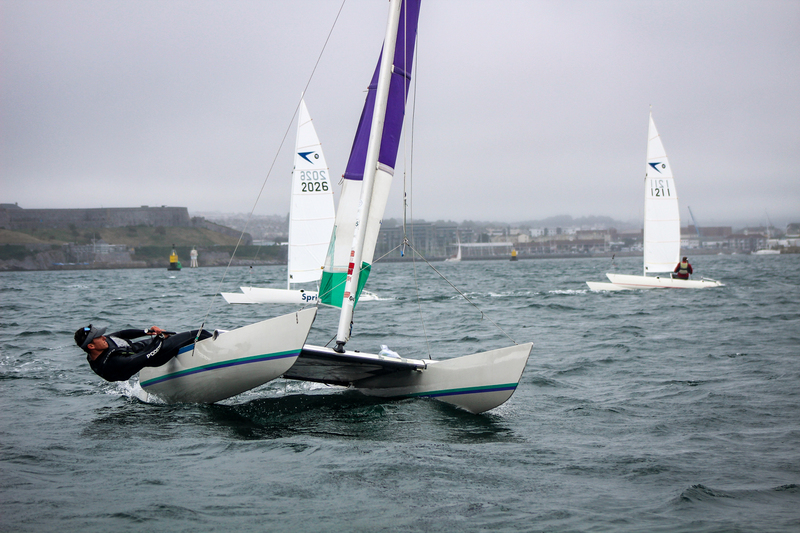 Also Tom Gurney, the youngest in the fleet at just 14, was starting to work his way up the fleet putting pressure on some of the more experienced sailors and finished 6th in this race. For Race 4 the Race Officer shortened the course and the starting line, catching a few of the less observant helms out at the pin end of the line. Liam sailed another faultless race to take 1st, followed by Ed and George. Everyone had a great a day’s racing with no capsizes and we headed back to the Royal Western to recover and have a meal and drink at the club. Sunday saw an increase in wind strength to force 4-5 which was the most we have had at a TT all this year! Our Race Officer informed us that he was moving our sailing area to the east of Drake’s Island as one of the Royal Navy’s submarines was due out from Plymouth and we duly headed off in anticipation of some more great sailing. In Race 5 there were a couple of over enthusiastic helms who were over the line at the start and had to re-round as everyone else powered up the beat. Jon Pearse led round the windward mark, with Liam and Ed in hot pursuit. Liam soon took the lead with his superior off wind boat speed and led the rest of the way. Some of us were wishing the submarine might have surfaced to distract Liam but it hadn’t materialised by then. 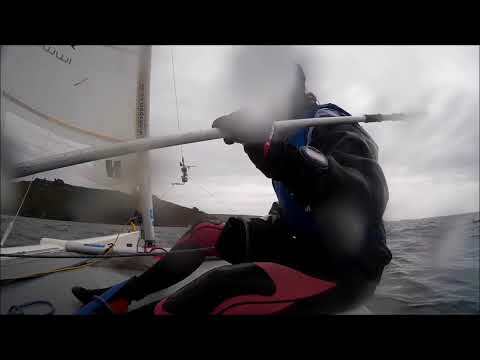 With the stronger wind suiting Simon Hare he came in 6th, one behind Jamie. With Liam having now won the event, he headed for home, leaving the rest of the fleet to compete for 1st place in the final race. Jon Pearse had a flying start and took an early lead which he held for the first lap but on the second beat he over stood the windward mark, allowing Ed to take the lead, who managed to stay ahead for the rest of the race, despite the arrival of the submarine to the east of the race area to distract us all. Congratulations to Liam for his 5 straight firsts, making him the clear winner and to the 4 young helms from Royal Western - Jamie Ward, Tom Gurney, Aaron Kirby and Daniel Drew who completed all 6 six races in some challenging conditions. They are certainly all promising young guns. A big thank you to everyone at the Royal Western for hosting a great event in a fabulous historic location and I am sure we will be back in bigger numbers, once the word has got out.